The fall season is upon us! Cool weather, the turning of the leaves, football, family gatherings, what’s not to love? The fall season also means there’s a cornucopia of seasonal recipes to bring into the mix, and nothing says fall like a pumpkin dish. Pick a pumpkin from your garden or barter with the headless horseman, there’s a tasty snack to be made from the iconic fall squash. This roasted cinnamon pumpkin seed recipe takes a classic snack and adds a little extra seasonal flavor. Best of all, it doesn’t take a top chef to make! Pumpkins – Grow 1 pumpkin per 2 Garden Grid™ squares (~2 square feet per plant). Water frequently (5 minutes every morning) and make sure they get a lot of sun! Cut open your pumpkin and collect all seeds. 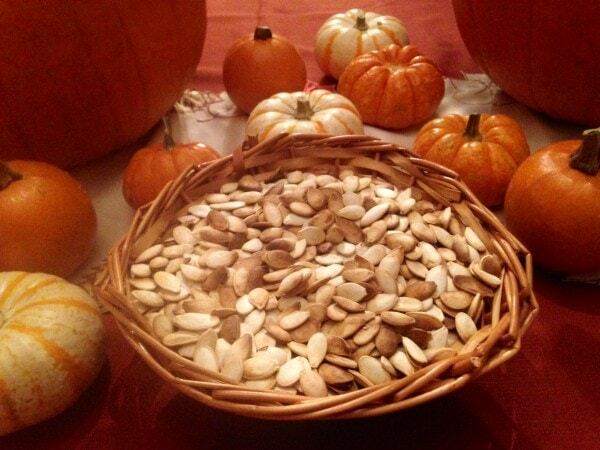 Clean pumpkin seeds (place ‘dirty’ seeds in colander and rinse with hot water). Boil for 10 minutes in salt water (1 tsp of salt for every half cup of pumpkin seeds). Drain and dry the pumpkin seeds. Spread the seeds evenly across a greased baking sheet, lightly coat with coconut oil, and lightly coat them with salt and cinnamon. Did you make this recipe? How’d you like? Do you have your own version? Let us know with us in the comment section below!